Kristin Beck, a senior double degree student in physics and mathematics at the University of Rochester, has been named a 2009 Churchill Scholar and will advance her studies at the University of Cambridge this fall. Beck is the third University of Rochester student in as many years to receive a Churchill Scholarship and, as it happens, the third to major in the rigorous Honors B.A. Mathematics program. Of the 102 participating institutions, the University of Rochester and Princeton University are the only universities to have students awarded Churchill Scholarships in each of the last three years. The prestigious scholarships, offered this year to just 14 students nationally, enable recipients to pursue graduate work at Cambridge in engineering, mathematics, or the physical and natural sciences. While at Cambridge, Beck will study quantum optics in the Cavendish Laboratory under the tutelage of Michael K�hl. "I have had the privilege of working with our Churchill nominees since 1982," said Suzanne O'Brien, associate dean of undergraduate studies and director of the College Center for Academic Support, "and Kristi is clearly extraordinary even in this extraordinary group." 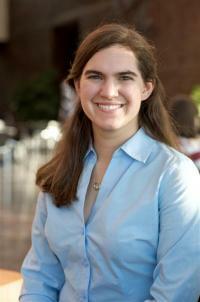 Beck, a native of Colts Neck, N.J., has won several national awards for research during her undergraduate career. "There is something special about quantum optics that fits into my unique set of skills," said Beck, 22. In Boulder, Colo., Beck worked with scientists on the atomic clock, which sets the national time standard. She also traveled to Meyrin, Switzerland, to test and prepare part of the Compact Muon Solenoid for data acquisition from the Large Hadron Collider, the highest energy particle accelerator in the world. Her success in the classroom has earned many accolades, including the Catherine Block Memorial Prize for the most outstanding woman science student in the junior class, and the Stoddard Prize for the best sophomore math student. She was inducted into Phi Beta Kappa and Sigma Pi, the physics honor society, and in 2007, was named a Barry M. Goldwater Scholar for excellence in science. In addition to her two degrees-a bachelor of science in physics and a bachelor of arts in mathematics-Beck pursued a musical interest in the flute and will graduate with a minor in music. Faculty and administrators who have worked closely with Beck welcomed news of the scholarship. "After nearly 10 years of advising students at the University, I can say without hesitation that Kristi Beck is among that handful of exceptional students, who, from day one, make you think they would be ideal candidates for the highly sought after fellowships," said Belinda Redden, director of fellowships and assistant director in the College Center for Academic Support. Established in 1959 as an expression of admiration for Prime Minister Winston Churchill, the Winston Churchill Foundation began offering scholarships to American students of exceptional ability in 1963. The University of Rochester is one of a select group of distinguished colleges and universities invited to nominate undergraduates for the award. The Churchill Scholarship covers all tuition and fees, valued at roughly $25,000, and provides upward of $20,000 for living expenses and travel costs.